Czesława Gospodarek (born Cieślak; 10 June 1938 – 5 December 2011), known by her stage name Violetta Villas, was a Belgian-born Polish and international cabaret star, singer, actress, composer and songwriter. Her voice was characterized as coloratura soprano, which spanned over 4 octaves. She could play the piano, violin, and trombone and had absolute pitch. Characterisations of her included "the voice of the atomic age", "the singing toast of the continent", "a voice like French champagne", and the "Polish Yma Sumac". Villas was the first star of the Casino de Paris at Dunes Hotel & Casino in Las Vegas (1966–1970). Villas was known for her conspicuous wardrobe and number-one hits. During her show business career, Villas acted in six films, performed in numerous musical shows, and recorded almost three hundred songs in ten languages, including Polish, English, French, German, Italian, Latin, Neapolitan, Russian, Spanish and Portuguese. She was an animal rights activist. Villas was a very controversial person for her alcohol and morphine addiction and being a Security Service of the Ministry of Internal Affairs informant with the code name Gabriella. Moreover, she had a delusional disorder, which had a bad influence on her contacts with her environment and family. In 2011, Villas received the Medal for Merit to Culture – Gloria Artis. Villas was born in Heusy, Liège province, the third of four children. She spent her childhood in Belgium. Her father Bolesław Cieślak (4 December 1907 – 9 May 1960) was a miner and bandmaster, and her mother Jane (26 January 1914 – 17 February 1985) was a housewife. In 1948 she came with her parents to Poland and settled in Lewin Kłodzki where she began studying music. She played the piano and violin in her youth. In 1956 she began studying solo singing at the State Musical High School in Szczecin. She continued her artistic education in Wrocław with a professor Gisela Posh. In 1959 she began classical vocal lessons with a professor Eugenia Falkowska in Warsaw. In 1960, Villas made her debut on Polskie Radio at the invitation of its director of music, Władysław Szpilman. Her first broadcast songs were Gdy zakwitną czereśnie and Ja nie mogę tamtej drugiej znieść. 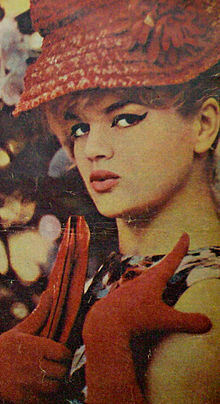 She recorded her first album, "Rendez-vous with Violetta Villas" in 1962. She received her first noteworthy prize at the Sopot Festival in 1961 and 1962. In 1964, 1965 and 1966 she performed at National Festival of Polish Song in Opole. In the early 1960s, Villas toured many countries in Europe, including Germany, Belgium, Switzerland, Spain, Russia, Czechoslovakia, Bulgaria and Romania, as well as in the United States, Canada and Israel. In 1964 at the National Festival of Polish Song in Opole, Bruno Coquatrix invited her to France. At the 3rd Festival International des Variétés et Music-Halls in Rennes, Villas received her Grand Prix International d'Interpretation (she sang including Ave Maria). In 1965, she performed at the Fontaine Theatre (show Roue de la Chance, director André Chanu). In 1966, at a personal request of Bruno Cocquatrix, Villas appeared in the Grand Music Hall de Varsovie, revue program at Olympia. The premiere was 26 July 1966. Villas sang including Ave Maria no Morro and Hiroshima Mon Amour. In Paris she was approached by Frederic Apcar, who invited her to Las Vegas. 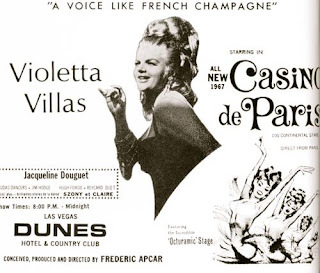 In December 1966 Villas performed at the Casino de Paris at Dunes Hotel & Casino. In her first program she sang including "Under Paris Skies", "Granada", "O Sole Mio", "Strangers in the Night" and "Libiamo ne' lieti calici". Villas sang in duets with Frank Sinatra, Paul Anka, Barbra Streisand, Charles Aznavour, Sammy Davis, Jr., Eartha Kitt, Dean Martin. Her personal stylist was Patrick Valette, a Frenchman from fashion house Dior. She performed her show with a hundred-person French ballet. She lived in a villa with private swimming pool. In late 60s Villas recorded twenty songs for an American Television and Capitol Records. In March 1968 began a screen test for MGM film studio, where she was later signed to a movie contract. Villas was offered a lucrative eight-year contract with Paramount Pictures but turned it down because of her mother's illness which saw her to return to Poland. The Polish Communist authorities confiscated her passport, which confined her in Poland for over a decade. However, she was not completely banned from the media and was able to pursue her career locally. In 1985, she made a comeback, just a few years after martial law ended, in a series of sold-out performances. Authorities returned her passport, and she resumed her international career. She later toured the USA and Australia. In 1987 she went on the tour, "Violetta" in the United States and Canada. The premiere was September 14 at Carnegie Hall, where she received a standing ovation. In New York her concert was sold out. Villas performed in Las Vegas, Denver, Miami, Texas, Montreal and Chicago. Before Villas started her theatre career in Poland, she performed in international revue shows in France and United States. In 1978 she played at the Grand Theatre in Łódź in the musical show Kochajmy się. In the 1970s/80s Villas was a star of the Siren Theatre in Warsaw. Villas played several roles in her theatre career, including Lygia in Trzeci program (The third programme, 1978) and the main role in the revue Violetta (1986–1988). In 1986 she returned to theatre, performing in Violetta with an orchestra and ballet. In 1992, Villas played in the musical Hello, Dolly! at Cracow Operetta House. In the 1990s she performed at Warsaw Operetta House in her own programme, The Violetta Villas Show. In 1954, when she was 16, Villas married lieutenant Gospodarek but they divorced just two years later in September 1956. Her parents had pressured her into the marriage but she did not truly love him. She left her husband to study music in Szczecin. They had one child, Krzysztof Gospodarek. In 1987 she met an American businessman and millionaire of Polish descent, Ted Kowalczyk, and married him on 6 January 1988 in Chicago. The wedding ceremony was held at a banquet room of the "Orbit" Restaurant, a fixture of Chicago's Polish Village. They divorced in December 1988. He gave many interviews in the media about their marriage, but she said on a TV show "I made an error, that I believed so fast." Villas died on 5 December 2011 in Lewin Kłodzki at the age of 73. 1961 "I don't believe you"
1961 "I don't make it"
1961 "For you my darling"
1962 "Look straight into my eyes"
1964 "The love begins with a smile"
1964 "There is a time for love"
1987 "The pine from my dream"
1987 "Take me from Barcelona"
1962 Do you like to dance? 1978 Good evening, it's Łódź! "Look Straight Into My Eyes"
^ "Violetta Villas". The Independent. 2011-12-07. Retrieved 2014-12-26. ^ "Villas brała morfinę!" [Villas took morphine!]. pudelek.pl. Retrieved 2009-03-09. ^ "Akta 'Gabrielli' – kontakty Villas z SB" [Gabriella's files – contacts Villas with SB]. ksiazki.wp.pl. Retrieved 2011-12-06. ^ "Rodzina Villas walczy o spadek" [Villas' family fights for inheritance]. tvp.pl. Archived from the original on 2012-01-08. Retrieved 2011-12-27. ^ Scislowska, Monika (7 December 2011). "Coloratura soprano, cabaret star Violetta Villas dies at 73". Washington Post. Retrieved 2011-12-06. Wikimedia Commons has media related to Violetta Villas. This page was last edited on 5 March 2019, at 13:01 (UTC).